Canada, Queen's University and its Faculty of Law are all celebrating special anniversaries this year. But these things share more than just a common date. All 3 are also connected in a synchronicity of people, time and place that links them in interesting ways on their 150th, 175th and 60th respective birthdays in 2017. This year is the 150th anniversary of Canadian Confederation in 1867, the date on which four British North American colonies united to form a new country. 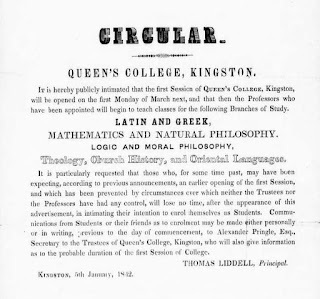 It's also the 175th anniversary of the opening of Queen's University, which, as described here, started classes back in 1842. 2017 also happens to mark the 60th Anniversary of the opening of Queen's University's law school back in 1957. There is a great article from a few years ago detailing the history of the modern law school, from Mark Walters, available here, "Let Right be Done". Professor Walters' article also takes time to describe the earlier attempts at establishing a law school at the University in Kingston. These earlier efforts to found a program of legal education, starting in the 1860's, connect Confederation, and the earlier opening of the University, with the ongoing history of the law school. As Queen's opened its doors in 1842, down the street was a small law office presided over by a young lawyer, who would later go on to become Canada's 1st Prime Minister. At the same time, that law office sheltered 2 even younger articling students, Alexander Campbell and Oliver Mowat, themselves both future 'Fathers of Confederation', see here and here. When a few years later, Queen's University decided to expand its academic offerings by creating a law school, it was Alexander Campbell who became its 1st Law Dean. Not to be outdone by his former student-at-law, it was John A. Macdonald who was awarded the 1st ever honourary doctorate in law by Queen's in 1863. Mowat, the other articling student in that long ago Kingston law office, went on to become Macdonald's bitter political rival, whose subsequent constitutional legal battles with the 1st Prime Minister ended up setting the fault lines of the Canadian federal state for years afterward. 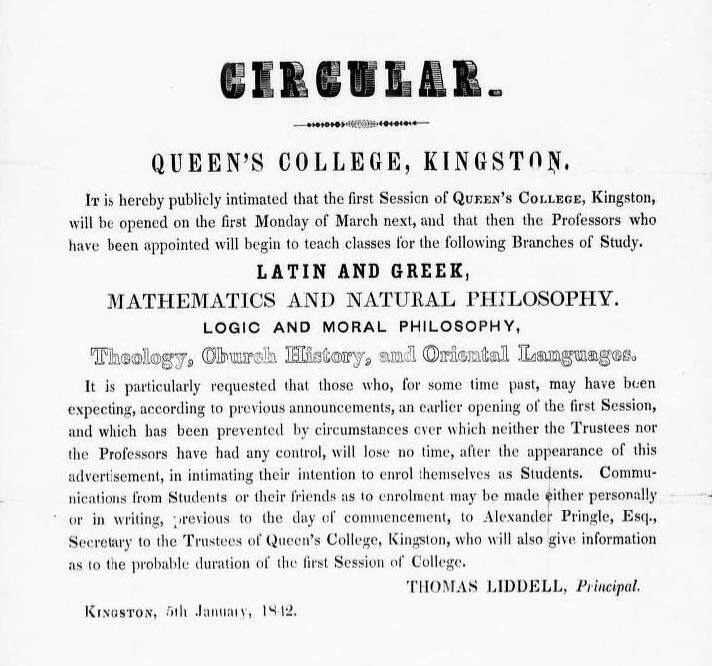 The initial attempts to maintain a law school in Kingston in the 1800s did not succeed. However, it was partly these historical connections that led the building housing the modern law school to be named after the 1st Prime Minister. Sir John A. Macdonald Hall was opened by Prime Minister John Diefenbaker a few years after the Faculty of Law re-opened in 1957, see here. It's in this way that Canada, Queen's University, and its law school, share a number of historical, political and legal connections, in addition to all celebrating important anniversaries in 2017.